If your team is scattered across various time zones, yet has to work towards a common deadline, you no longer have to do cumbersome time zone conversion. Since InLoox Version 9, InLoox for Outlook references the time zone set on the device you are working with and automatically converts your deadlines for you. Double-click on the date and time in the lower right corner of your monitor. 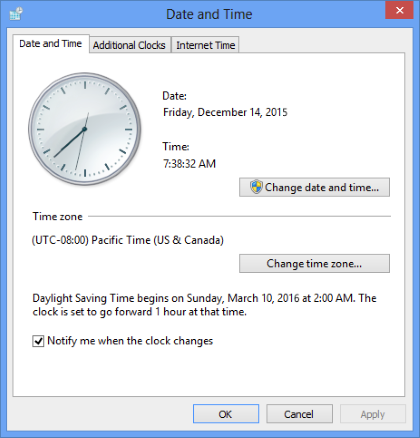 Click on Change date and time... if you would like to change the settings. Select the suitable time zone. InLoox for Outlook will now convert all the dates and deadlines for you. How to change the time zone | InLoox 10 • Copyright 1999-2019 © InLoox, Inc. All rights reserved.